Baseball Positive runs a Fall Instructional Ball program each year with youth leagues around the Seattle area. The program goes for five weeks with one weeknight session and one weekend session, each being two hours in length. The ages of most of the kids is 8-10. The program includes coaches and parents from the league and serves as a training program for the adults as well as the kids. The first part of each session is drills and teaching and the followed by a scrimmage. The scrimmage is structured as a teaching tool with the kids getting feedback from the coaches following each play. We try to limit the instruction to a quick comment to each player. Given the half dozen or more coaches that are on the playing field, most every player receives feedback following each play. Below are the plans for each day and a follow up comments of how each day goes. Remember, just because we have a detailed plan it doesn’t mean things run just the way we want them to. The follow up tells of what worked well and what did not. We hope to learn from the points where there were struggles and as a result, improve our coaching skills. Follow along with us over the next five weeks as we do our best to teach the kids and maintain an active and fun environment and, as coaches, learn a few things about working effectively with kids and teaching them the game with in a way they can best consume, digest and carry out the concepts presented. It is important that you and the kids know the purpose of the drills. Simply going through the motions of doing a drill does not lead to much skill development. PLEASE, if I have not made the objective of drill clear, ask so I can make sure everyone knows what we are working to accomplish. The first two days of scrimmage will not be pretty. And we will, in most instances, just let things go, but we will be laying the foundations for game to be played well in the subsequent weeks. Our rule as coaches is to not instruct the kids on anything that has not been covered in the previous drill segments from that day or an earlier day. Our goal in scrimmage is to acknowledge kids for doing things correctly more often than we correct mistakes; 3:1 ratio. The first few days this will likely not be possible, since we will be asking them to do things that are entirely new to many of the kids. As we get into days three and four and beyond the kids will start to ‘get it’ and we will have plenty of opportunities to acknowledge them doing things well. - I will be constantly barking throughout the scrimmage, so you can take some cues from me. Participating in this program should be stress free for you and the kids. Don’t feel like you are required to know a lot or to ‘coach’ a lot. Experienced guys, be patient. We have 10 days and 20 hours to get everything in; there is a plan. If you feel something is missing, it likely is coming later in the plan. Please ask me why something has not been addressed. If you have a limited background; no big deal; this is low level, kids baseball. If you have a lot of baseball knowledge; be careful, it is real easy to start pulling decades of experience and knowledge out of your brain and start firing it out at kids who have only been on a ball field in a structured situation a few dozen times in their lives. Remember, these are just kids, playing low level baseball. ...There is only so much information they can process at one time and in a given amount of time (2 minutes, 2 hours, 2 workouts). ‘The defensive player DOES NOT stand in a stretch position prior to the ball being thrown by their teammate’. - we MUST work hard to eradicate this misconception from the game. When a player stands in a stretch position at a base, we must correct them IMMEDIATELY. - If they ARE NOT moving their feet to catch and throw (and they won’t) they need to be reminded! The rotation is very simple. Starting at third base, the players move one position to their left when they rotate. 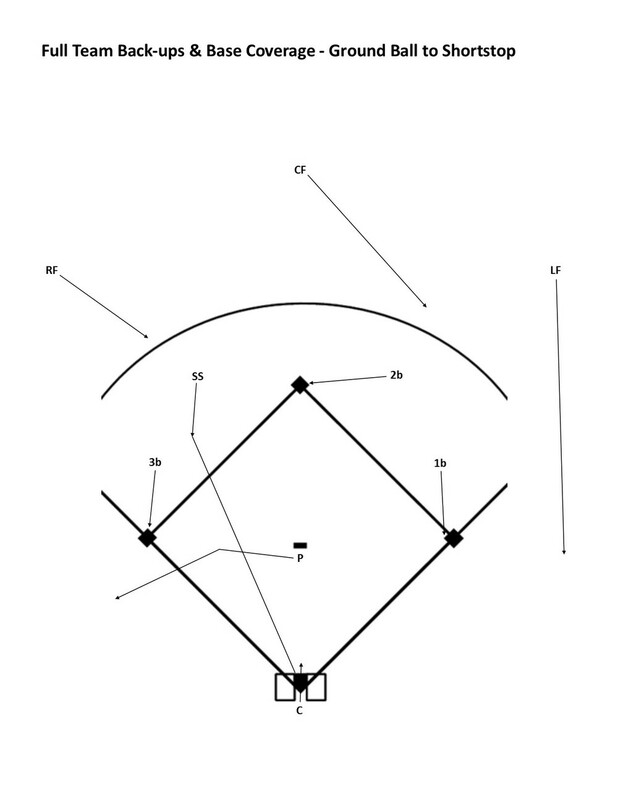 The third baseman moves to left field, the left fielder moves to shortstop, the shortstop moves to center field, etc. From first base the rotation follows the position numbers: 3-2-1; first base to catcher to pitcher. The pitcher rotates to third base. We had well over a half dozen coaches and parents on the field for Day 1; a great turnout! This resulted in our drills running well with constant movement and the kids getting a lot of reps. Enough cannot be said for the value of having a lot of adult bodies involved in a practice setting. Our drills today used the Mini Diamond. This was a new concept for a lot of the kids (and coaches). We had four Mini Diamonds set up next to each other using cones for the bases and to mark the outfield positions. Given these two factors it was a bit confusing for the kids when we added in the fast pace of the drill requiring them to move quickly into position in relation to the bases/cones. However, the drills ran very well. Come scrimmage time, the kids did an outstanding job of moving around the field considering the fact that they were executing actions that most of them, only an hour earlier, were not familiar with. We achieved our primary goal of the day, which was establishing the concept that they had to ‘move’ when the ball was put in play. Credit also goes to the coaches who ran the drills (many of whom were learning the concepts right along with the kids). After everyone involved becomes more familiar with the layout and concept of running drills on a Mini Diamond and/or running drills in a more compressed space we will continue to get the greater number of reps as we did today and the rate of learning and the level of retention will increase significantly. In our brief scrimmage the kids demonstrated that they did learn quite a bit in a short time. This is not only a credit to the work of the coaches, but a testament to the idea that teaching the game is not complicated and does not require a high level of experience or expertise. Let’s not rest on our laurels, however. It will require us to continue reinforcing these concepts, in subsequent scrimmages, for them to become instinctive and habit. The kids are getting the idea of movement. They have made a good start, but it is up to us that the progress continues. We cannot get complacent as coaches. We must (slowly and surely) increase our expectations for the kids moving to where they need to be on the field. Pitchers: Sprint toward a corner base on balls hit to the infield. We must keep in mind, that at this point in their learning, the kids are tentative about running around the diamond from the pitcher’s position…this is something they have never seen or done, at their level of play. Outfielders: Backing up throws to bases. We need to continue to express to them the need to Sprint to the correct point beyond a base in order to be in position to properly back up a throw. Remind them that if there is an overthrow they will need to get to that point in four seconds….which requires them to Sprint. Middle Infielders (SS/2b): Must Sprint towards the ball when it is hit to the outfield. It is important that they clear out of the infield space to eliminate the clutter of bodies to make it easier for the outfielders to identify who is covering each base and what the runners are doing. On balls hit deeper into the outfield, by getting into the outfield quicker, they have a better chance of getting into the proper position to take a throw from the outfielder retrieving the ball. Finally, you have noticed the kids having trouble with their awareness of the runners. At this point in their learning they are consumed by all we are teaching with regard to ‘movement responsibilities’. In a few more days, as their movement responsibilities become more familiar and instinctual, more brain space will become available for them to be more aware of what (all) the runners are doing. The kids are doing a good job of moving, but not yet aggressively enough. That is to be expected, however, because they are learning to implement concepts that are new to them. In our next scrimmage we want to be more specific on where the coaches on the field stand and which players each works with. We will have an adult in each of the base coach boxes. These coaches will have a big responsibility on all balls hit on their side of the infield. They will make sure the correct player is covering the corner base, that the pitcher is sprinting over to that base and that the outfielder on that side of the field is springing in to back up the ground ball. We will have a coach behind each of the middle infielders. Those coaches will support the coaches on the corners in getting those kids moving to the correct spot (we will have ‘bookends’ around those position groups). These two coaches will also be there to remind and help the middle infielders in moving properly on balls hit to the outfield. “Cover the base with your eyes” - Kids are naturally unsure of looking away from the ball when covering a base because they know a ball may be thrown in that direction. Also, kids are curious by nature. Looking away from the ball (and all the action) in order to cover their base means they miss out on what is going on. Our job is to point out to them that it only takes half a second to get to their base and cover it; and after that half a second has passed they get to watch all the action. The difference is they are now in position to contribute to the play and have the best possible chance to contribute successfully. Outfield Defensive Responsibilities - On Day 1 we trained our outfielders that they, when not chasing the ball in the outfield, should be sprinting to back-up throws to the one base we had designated for them in a drill. They were left with the idea that that was all the were responsible for. The good news is they have heard the teaching phrase, "Move Towards The Ball" quite a few times in reference to the responsibilities of the shortstop, second baseman and pitcher. We have also exposed them to the concept that ALL players on the field, when the ball is first hit, should react toward the ball with the mindset, "I am getting the ball". The first two responsibilities for an outfielder are consistent with our teaching - The outfielder 'Moves Towards the Ball'. As we progress in our scrimmage time the rest of the fall we will remind the outfielder of this rule. And we will then point out that rule #3, 'Back up throws to a base' applies when the ball, for left fielders and right fielders, is hit to the other side of the field and for center fielders when the ball is not hit straight in front of them. We want to increase our conversation with the players about the fact that the bases do not belong to any particular defensive player - the bases are out there for the Runners. The shortstop, second baseman and pitcher continue to be shy about covering the corner bases (first and third). This is because they consider those to be ‘someone else’s base’ (the first baseman and third baseman). Also, the shortstop and second baseman, demonstrate in their movements, that they think second base is ‘theirs’. We still have balls being hit to the outfield and both the second baseman and shortstop are running to second base. The iron clad rule for the players in the middle of the field is to “Always Move Towards the Ball”. We coaches need to do a better job at reinforcing this ‘simple’ rule for the players in the middle of the field to follow. …and to support that with the fact that they bases do not ‘belong’ to any player on defense. Today we introduced ground ball fielding technique. Just because we taught this to the kids does not mean they will suddenly become masters at fielding ground balls. We emphasized the fact that the Feet are the key to success in fielding ground balls. In our conversations with kids the rest of the fall we must keep the focus of our instruction on ‘feet’. We will talk about footwork in catching fly balls in our next session and will review ground ball fielding footwork in subsequent sessions. The sooner we can get our players to gain awareness of what their feet are doing when fielding, the quicker they will develop this fundamental skill. Also, we introduced the ‘Wrist Action’ drill to our Throwing Drills segment. This drill, which takes 15-20 seconds, is one that all coaches want to have their players do each day prior to playing catch. The drill trains kids to use a proper release in their throws, which greatly reduces stress on the elbow. The ‘Turn and Pull’ drill that we have being doing since Day 1 trains proper throwing actions to greatly reduce stress on the shoulder (rotator cuff). These two drills when performed each day prior to playing catch will greatly reduce sore arms and potential injury to the arm. The nice thing is that once the kids get used to doing these each day (takes 3-4 days to establish the routine) the set of drills only takes half a minute. Our Team Drill segment today focused entirely on Fly Balls. * catching a fly ball involves running blindly (looking up to the ball and not where you running) and attempting two skills at one time: 1. running and 2. catching. Most kids (including 12 year old All-Stars) have not had much exposure to, and skill building repetition in, catching fly balls. The unfamiliarity of this skill, the uncertainty of attempting it, and the simple lack of practice repetitions and experience all contribute to young players’ tendency to slow down while tracking a fly ball. Footwork and actions are our first teaching/learning priority. Later, after three or four days of drilling, we start being concerned about the kids actually catching the ball. The first few days we are working on fly balls our goal is to (1) get the kids moving correctly (footwork and maintaining a fast running pace) and (2) establishing the habit of extending the glove out away from the body (so to get the glove and ball in their line of sight when attempting the catch. These are not ‘reading fly balls’ drills. We are not chucking the ball a mile in the sky in these drills. These are ‘catching the ball while running’ drills. The toss should only be high enough to keep the ball in the air long enough for the kids to execute the footwork/running aspect of the drill. For the ‘Drop and Go’ drill, we want to toss the ball approximately 20’-25’ in the air – high enough for them to get moving back to the spot where the catch is made, but not so high that we unnecessarily increase anxiety of making the catch. The arc of the toss in the ‘Angling Back’ drill looks much more like a pass made in football than a fly ball in baseball. I like to tell the players to pretend they are a receiver in football when running the drill. The toss for the ‘Angling In’ drill does not need to be higher than 10’-12’ in the air. We want the ball to be in the area between the shoulders and knees when the attempt at the catch is made. After a while some of the attempts at making this catch turn into the kids diving for the ball - many of the kids (not all) love to dive for the ball. The (attempt to) catch the ball is only half of this drill. After the catch, the players then need to return the ball to the coach. Throwing the ball back is an opportunity to develop throwing skills IF, we as coaches, make it clear that the throw back must be executed properly. Most every fielding drill has two parts: 1. Catching the ball, 2. Throwing the ball. In many cases we coaches concern ourselves with the fielding (catching) part, but allow the kids to use poor throwing mechanics when getting the ball back to us. I urge coaches to require (discipline) their players to make every throw during practice using technically sound throwing technique. The primary factor of a ‘technically sound’ throw is “Move Your Feet to Throw”. On longer throws the player shuffles their feet toward their target (or use a ‘crow hop’) when throwing. On short distance throws the player runs towards their target (coach) and makes an underhand toss. The primary goal of these drills (as with all drills) is to maximize repetitions. First, this requires making the kids clear on how the drill is set up and run. Next, we want to run all drills in as compact a space as possible and finally, use delivering the ball in a way that is most accurate. Throwing/Tossing the ball is almost always going to be more accurate than using a bat. NOTE: Many coaches question the value of tossing fly balls (and rolling/throwing ground balls) in drills. My best (and shortest) response is to tell them that when I was in the Cubs organization, during Spring Training, our outfield coach (the legendary Jimmy Piersall) tossed us fly balls in many of our drills. Later when I was an assistant at (1989 College World Series Champion and eight time CWS participant) Wichita State, the coaches there also tossed fly balls (and rolled ground balls) in many of the drills. Yes, it is important for players to see balls off the bat, but is also important for them to get massive repetitions in drills. Tossing is far more accurate, resulting in most every repetition producing the development of skills. Take a look at this video of Texas Rangers farm hands. Most of these drills involve the coaches tossing or throwing the balls. The fact is that at the highest levels of the game coaches do not always use a bat to deliver the ball in drills. I cannot emphasize enough the need for youth coaches to recognize that removing the bat from the drill equation is not only OK, but vital in getting kids the Good reps they need in order to develop. In many other scenes the balls are being rolled/tossed, but unfortunately the coaches are not included in the shot. The coach isn’t ‘crushing’ the ball at the players (to ‘challenge’ them). The objective is to deliver the ball accurately and consistently to the same spot, which allows the players to focus on their footwork and actions …and get massive repetitions. The coach is not trying to ‘trick’ the players by changing up where they deliver the ball. The ball is delivered to the same spot over and over, so the players can repeat the same action over and over in order to develop the specific skill they are working on at that time. Final note: in all these drills there is little or no standing around. The drills are kept compact and the balls are delivered quickly and accurately by the coaches. The result is massive repetitions and increased opportunities for skill development. Many of us, and more importantly our players, see base running as an activity that stops and starts. And in a literal sense that is true. Our goal throughout fall ball is to change the perspective our kids have toward their game and their mindset when playing the game. The mindset we want to instill in our players is that running the bases is an on-going activity that doesn’t ‘stop’ until they reach home plate. In order for the kids to act out that mindset we taught them to approach a base in a way that allows them to maintain full running speed while making that ’90 degree’ turn. We also taught them the best spot to land their foot when crossing the base. The spot we taught them to touch is the closest point to the next base and the spot that enables them to use the base to push off and accelerate them forward in their running. We concluded by pointing out to the kids that while their mindset is to always advance two bases on balls hit to the outfield, they don’t want to aimlessly run into an out. The mindset we want to establish is, “I am going to force the defense to make me stop” by getting the ball to the base in front of me (or get the ball to the middle of the infield) where if I continued to run they could get me out. But the journey to home base has not stopped, just like coming to a stoplight doesn’t halt our mindset of reaching to our destination when driving. We are only waiting for it to be safe again to continue moving ahead. The base runner’s journey around the bases pauses briefly while it is not safe to continue moving forward. Their mindset, however, is to continue moving the moment they see an opportunity and they will only take a pause in that ongoing movement forward when the defense proves to them that it is unsafe to do so. We also need to make it clear to our players that in a practice or scrimmage situation they want to test the defense to find out how good they are at getting the base runner out. In order to find out they have to take chances. When they take chances they risk making an out. But making an out in a practice or scrimmage is OK, because through that process our base runner gains a better understanding of which circumstances they can continue moving ahead and in which circumstances they want to wait for the next opportunity. We can extend this beyond practice and scrimmage into the early part of the regular playing season. Winning and losing early in the season is not critical. Learning what can and cannot be accomplished through aggressive base running early in the season leads to better decision making later in the season, playoffs and beyond. In closing we must not lose sight of the fact that most kids have trouble with the concept that learning through ‘getting out’ is a positive thing. Most kids see the current competition as the biggest thing in the world and don’t see the broader picture. This is where we, as adults, can teach kids how making a mistake in today’s activities can help them to become better players in the long run. …and this is not easy. While the kids may not get it today, our words will stick with them and at some point down the road, our words will resonate and they will benefit. The first thing we clarified for the kids and coaches is the 60’ game, in some cases, is different from the game played on the larger diamond. One significant difference is the Pitcher is always the cut-relay player on plays to the plate in the 60’ game. Outfielder: The fundamental approach to fielding a ground ball is the same as an infielder:: SLOW feet down to catch the ball, move feet FAST to power the throw. Pitcher:: “Always Move Towards the Ball”. This rule gets the pitcher moving toward where they need to be as the cut-relay player. The kids executed pretty well and, at the very least, demonstrated they understood what their responsibilities were and how to execute them. The results were not perfect. That comes later through more repetition. We learned as coaches that by training certain skills and actions first, they can be used to construct and teach a more complex skill more effectively down the line in the sequencing of when skills, drills and concepts are introduced. The light bulb of understanding defensive responsibilities has gone from a flicker to a brighter glow now. Through the fast pace of our scrimmages the kids have now seen the common situations of the game many times. They are making the transition to quickly reacting instinctively to what is going on around them from having to think things through before executing their responsibilities. Today we moved closer to structuring our routine closer to simulating a regular practice. We introduced the Skill Building Warm-up to the start of our workout (Wiffle Ball Batting is not part of practice time. This activity is ‘pre-practice’). Batting and Throwing Drills were cut back closer to what would be run in a regular practice. We had one last aspect of the swing to teach, ‘anchoring the swing’, so needed to take the kids through three batting drills rather than just two, which is what we will cut back to on the final two days. Throwing Drills were cut back to just the two that would be run on a normal practice day. Playing Catch Practice only included 1. Pitching, and 2. Position Player Throwing Actions (“Move Your Feet to Catch”, “Move Your Feet to Throw”). We will not dedicate time to the ‘Skill Activity’ segment the rest of the fall. The three primary drills for the Skill Activity: 1. ‘Cut-Relay Player Footwork’, 2. ‘Catch, Tag, Power Position’, and 3. ‘Recovering Balls’ (“Pick up both sides of the ball”) were run the last three days. Our ‘Team Drill’ activity was ‘Mass Ground Balls and Fly Balls’. The ground ball aspect of this activity involves two groups of fielders working independently, but simultaneously, on the infield together. Because there are a lot of throws taking place at one time this activity can be confusing for kids the first few times they run the drill. Therefore we only had one group working at a time. This gave the players and the coaches a sense for the structure for the drill. We will expand the drill to involve both groups working at the same time on Day 10. What is especially satisfying is the kids are expressing satisfaction from playing the game correctly and are obviously having a lot of fun. Today flowed well. The kids are familiar with the routine, know much of the content and we were able to get through Wiffle Batting, Skill Building Warm-up, Batting & Throwing Drills and Playing Catch Practice without much direction from the coaches. The kids got a high number of quality reps that are needed each time they get on the field in order to develop skills. They ran through the activities using the proper actions that they have learned and become disciplined in, during the fall workouts. The feel, flow and activity of today’s workout is what we are shooting to achieve by early April when coaching our teams in the spring. Yes, it will not be until we have run four to five weeks of practice that we can expect practices to flow fairly well. Remember we are working with kids, giving them new content and establishing a new mindset of how baseball is played. It’s going to take 12-15 practices before we can expect practices to begin running smoothly. Keep in mind that as coaches will also be adapting to new content and a new mindset as well. We ran a ‘Pickle’ drill today - or at least that is how it first appeared to the kids when we told them what we were going to be working on. We quickly squashed their anticipation for getting involved in an activity of chaos and anarchy. While they expressed some disappointment when we told them we were not going to ‘play’ Pickle, but rather be working on the situation from the defensive players’ perspective and would be learning to execute a ‘Rundown’. 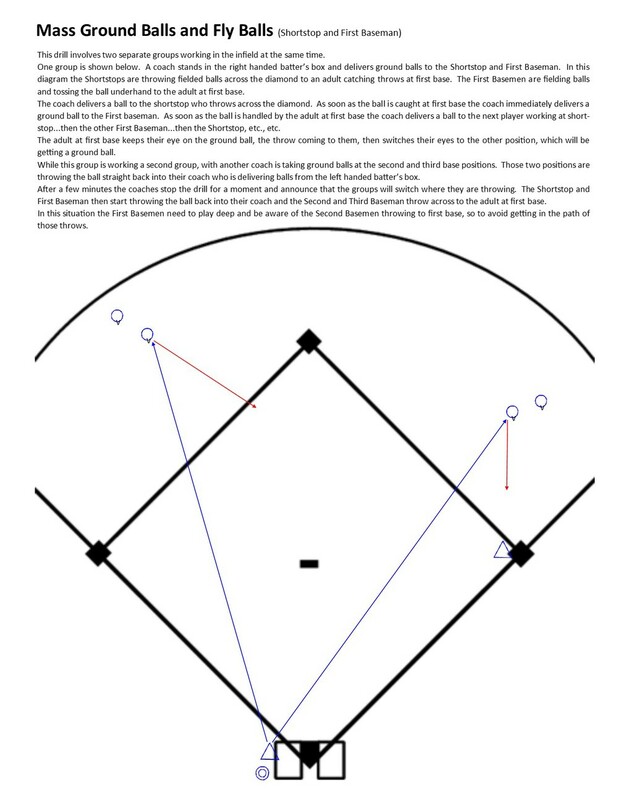 We took the process of eradicating their perspective of how things work when a runner is caught between bases when we told them the drill was called ‘Ambush’, which pointedly describes how this situation is addressed by the defense. When a runner is caught between bases the ball is not immediately thrown as many kids think and want to do. First the players on each side of the runner ‘Ambush’ the runner by aggressively moving towards the runner and boxing the runner into a small space. We learned today that practicing just one simple drill involving three simple rules that players is all that is required for players, of any age, including grown-up professionals, to have all the skills and understanding required to execute a Rundown…that is an ‘Ambush’. How Did They Pick This Up So Quickly? To the amazement of some of the coaches, the kids demonstrated an ability to execute an Ambush very quickly. This was (again, as when we worked on the Cut-Relay Play to Home) a result of the fact that the kids had already been trained in all the skills required to run an Ambush, they only needed to learn the three rules and then practice. When setting up the content of our practices where common core skills are taught early on, the more ‘complicated’ activities are fairly simple to teach and learn because the majority of the teaching and learning already took place in previous practices. We are then only required to add a couple of new points. Today we (coaches as much as the kids) worked on running ‘Mass Ground Balls and Fly Balls’ again. Remember, the aspect of the drill that takes place on the infield is two separate drills (groups) working at the same time in the same location. On Day 8 the drill was introduced and we only ran one group in order for the coaches and players to get accustomed to the routine. Today we ran each of the drills/groups individually as a refresher then split into two groups having them work simultaneously. The drill actually ran pretty well given that the coaches and players had limited exposure to the format. As we discussed, in the spring this drill should be run with only one group for 2-3 days before trying to have both groups running simultaneously. It will then take another couple days to get everyone comfortable with the flow. But as we saw today, even when everyone is in the process of getting used to the pace and flow of the drill, we are still getting so much more done relative to the traditional ground ball practice with kids lined up waiting their turn while one player is fielding. In Mass Ground Balls we have four kids involved at one time with four ‘waiting’. At the same time, the players 9-12 are in the outfield working on fly balls. Each is constantly moving, learning and developing skills through the ‘massive’ number of reps they get as a result of the coach tossing accurate fly balls rather than attempting to hit them with a bat. 2. When a player muffs a ball we have to hold off on tolling a ground ball to the next player until the muffed ball is recovered (“Pick up both sides of the ball”). This does slow the activity down by a few seconds, but that is going to happen when working with kids. 3. When a kids is not paying attention, skip them and roll a ground ball to the next player. Quickly they will come to realize that if they need to be ready to go or they get left out of the fun. The kids have really hit their stride in scrimmage. The kids have demonstrated in the last three scrimmages an understanding that they need to be moving when the ball is put into play, keep the ball moving throughout each play and quickly get back to their positions in order to be ready for the next batter. Their instincts for their defensive responsibilities are also kicking in as well as their awareness of all the runner son the field. We are far from perfection, but it does look like baseball. Our goal is to get to this level of scrimmage by early April next spring. Imagine how things will look two months later in early June?! My hope is that through your experience this fall you see the value of Scrimmage as a tool for learning and teaching. The experience from Fall Ball should set in your mind that concluding each practice with a scrimmage is not just a time for the kids to have fun, but is an indispensable part of their learning each time they come to the ballpark.